Texas Barbecue Photos: John Mueller Meat Co.
I’ve made a few runs by John Mueller’s new barbecue joint in East Austin but have yet to find a line that I have the patience to wait out. 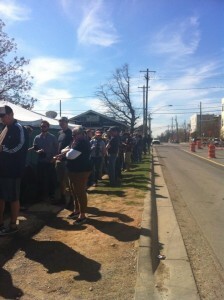 Here’s a photo from opening day when the line stretched all the way down Pedernales, and almost to the point where you could turn left on 2nd street, throw a rock and hit Live Oak Barbecue. This entry was posted in FOOD, Texas Barbecue, Texas Barbecue Photos, The Foodist and tagged Austin, barbecue, john mueller meat co., kellee's place, texas. Bookmark the permalink.